Ever since baby Brody was born six months ago, I have been extremely emotional. I have this unexplainable feeling of gratitude that comes alongside with being a parent. It always sort of strikes me, when I look at my beautiful baby, that before me stands a clean slate to teach him whats most important in life. I thank the heavens above for each day I get to be a mom to my fab four. Despite the chaos that comes with big families, I do find the notion of being their mom a complete honor. We’ve all heard it before that being a parent is the hardest job on earth. I couldn’t agree more. However, as much as it is hard, like most parents I too find it simultaneously rewarding. I love that I get the chance to create and mold our babies to always be kind and help those around them. It’s such an important job to raise your littles right, especially in the world we live in today. Moments to be had, memories to me made, even mistakes to be learned from. It’s no different from any other day with my little tribe, but there is hope that comes with a new baby entering the world. I will never forget when our friend found out we were having our fourth and he said that’s outstanding. “Awesome parents making more awesome people for our world.” I was so flattered as that was the ultimate compliment someone could say to us. 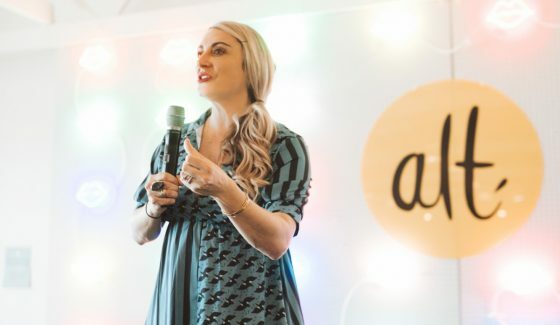 Lately, my sanity has been frazzled by my exhaustion, but through it all I have been trying to instill a routine that promotes relaxation during the baby’s downtime. The Blooming Bath has truly made my newfound night ritual perfect. I love bathing my baby in the sink instead of bending down and straining my back. 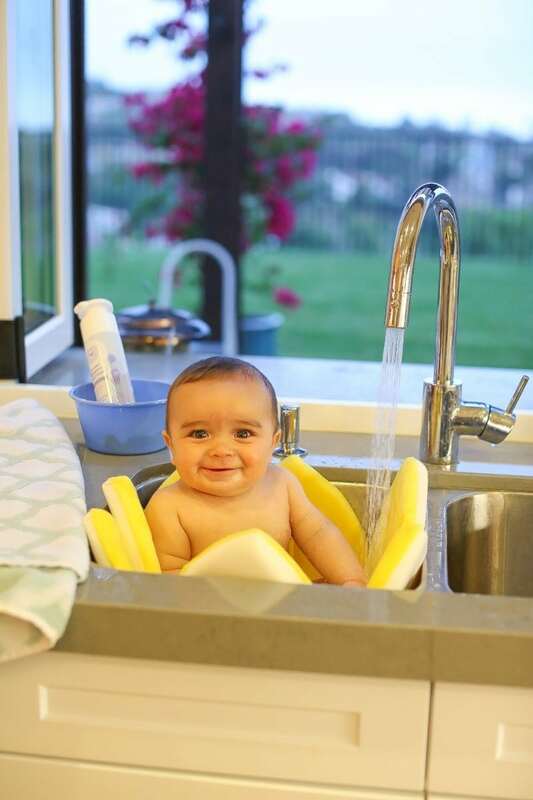 The soft petals of this flower shaped baby bath covers all corners of the sink, ensuring softness while he bathes. He truly loves it too. The Blooming Bath comes in various colors and is easy to use. 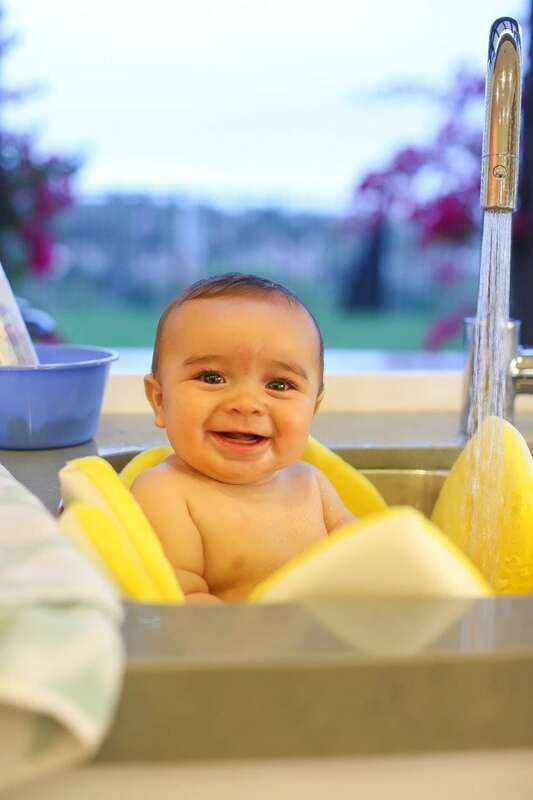 Once your baby is done bathing you just rinse out the excess water and throw it in the dryer. 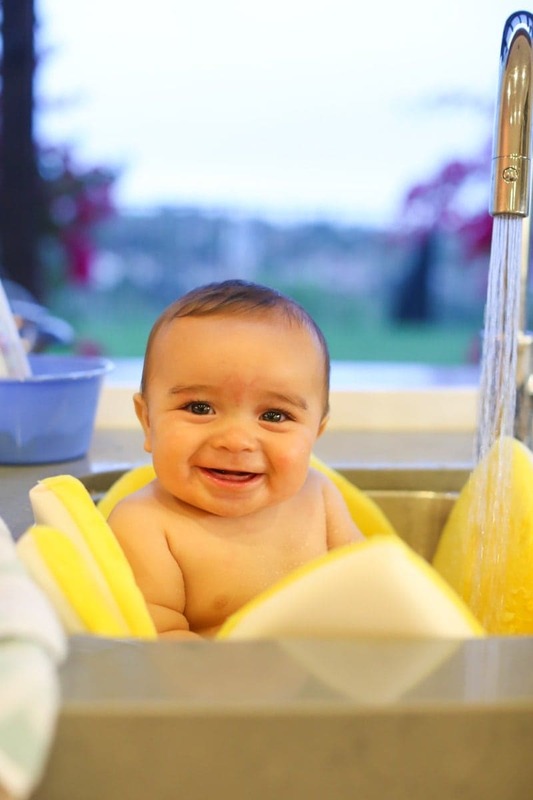 The Blooming Bath is recommended for newborns and babies up to one year. But something tells me it will end up in the grown up tub when baby Brody is ready to transition. I think it’s perfect and easy for a busy family of six. Another way to wind the baby down is the great outdoors. Sometimes baby Brody prefers to be close to me as opposed to being in his stroller. The Blooming Baby Carrier does that exactly for him. What I particularly like about this carrier is the ultra soft material they use that keeps him nice and snug. They took their product out of the bathtub and basically made a carrier out of it. Brilliant! It serves as a perfect carrier when going for long walks or just hanging at home. Brody loves facing out and the soft fabric that is close to his face makes him very comfortable. The fabric chosen allows for proper ventilation and breathability so neither me or him gets too warm. 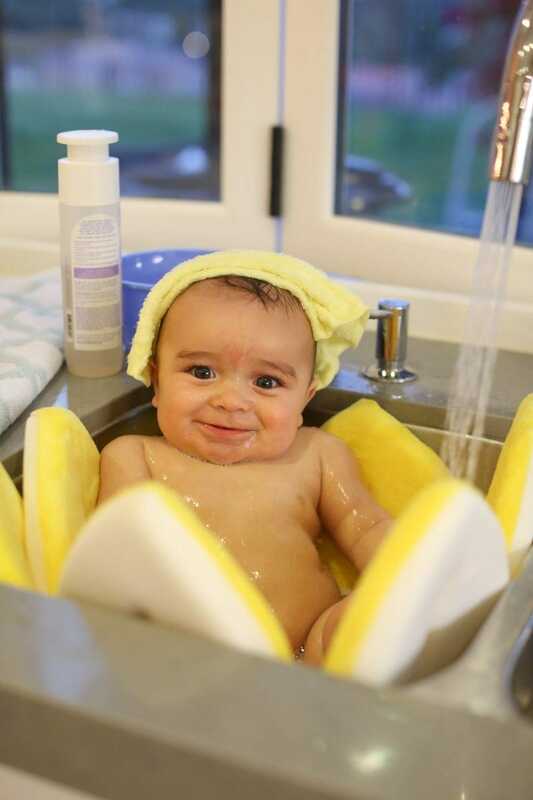 I do like that my baby gets to experience feeling relaxed with the same luxurious softness as he does using his Blooming Bath. It’s also a very comfortable carrier for me, and enables my Brody to either face me or face forward. No wonder this carrier was a 2015 finalist for the JPMA Innovation Awards. It’s nice knowing with my bad back that I have this carrier as a choice for my baby and as a choice for me. I am able to wear it for hours because they paid attention to details for both the mama and the baby! The advanced back support design evenly distributes weight on the center of my back for most comfort. 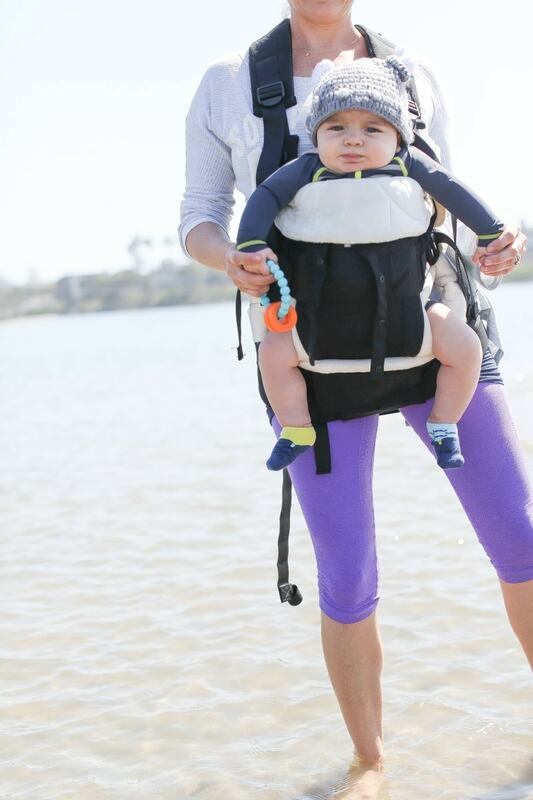 Its available in black with yellow, turquoise or ivory and it can carry babies from 7 to 45 lbs. I also love the hood for nursing or to protect the baby from the sun. Like I said, they thought of it all. 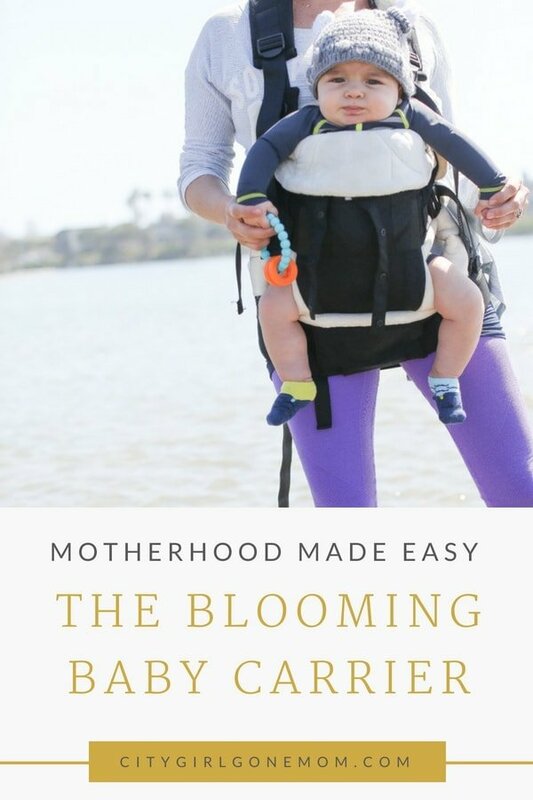 Thank you Blooming Baby for making products that add to making parenting easy and fun! Best part about my job! Blooming Bath has decided to give all of my readers 20% off of your purchase. Just use the code CITYBABY at check out. They also want to give one lucky person a Blooming Bath for you little one. 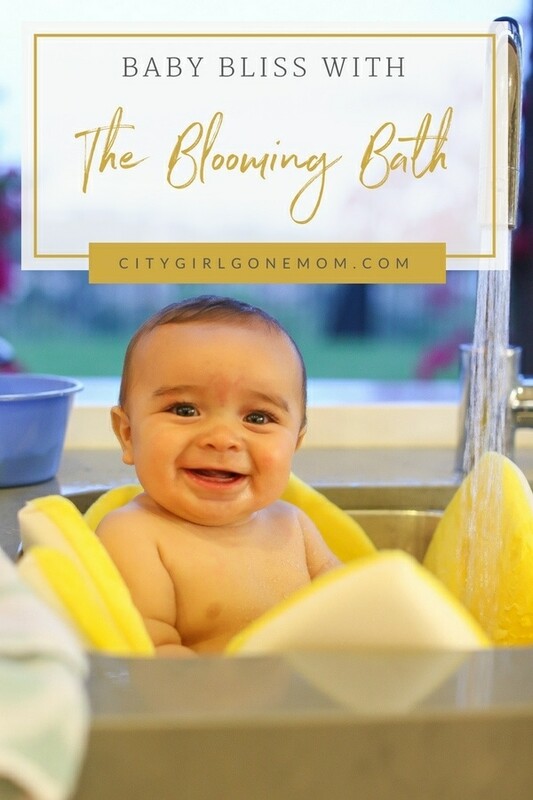 Follow both @citygirlgonemom and @bloomingbath on instagram and post a pic of your sweetie in the bath using hashtag #needabloomingbath for your chance to win a Blooming Bath! If you already have a Blooming Bath, #bloomingbath for your chance to win! Winner announced in ten days! Your blog is so amazing and four kids! You are a super mom. I am just on my second one and I really strain my back when bathing him. I am definitely going to steal your idea about doing it in the sink. It looks so comfortable, and not to mention fun for both of you when using the Blooming bath. I will be ordering mine as soon as possible.